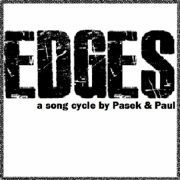 Edges is a song cycle by New York-based writing duo Benj Pasek and Justin Paul. It was written by the duo whilst they were at University of Michigan in 2005, and a year later they became the youngest ever winners of the $20,000 Jonathan Larson Award. The first professional production was MD’d by Justin Paul in Albany, New York in 2007. The show features songs dealing with the coming of age, relationships, identity, self-discovery, and the meaning of life. The most well-known song from the show is “Be My Friend”, which has become popularly known as “The Facebook Song” – an hilarious character song about the social networking site, Facebook, and the popular desire to add to the number of friends on your profile. Songs from the show have been performed by many well-known Broadway performers, including Shoshana Bean, Gavin Creel and Aaron Tveit. The song cycle has become particularly popular among college and amateur musical groups, due to the small band (often piano only, but sometimes with drums and bass), minimal set and costume requirements, and cast of originally four persons which can be scaled up as required.